Connect your customers to your brand by delivering what they want. Nothing predicts organic growth like having loyal customers. Find, foster and retain them with help from Gallup. Better understand your customers and create more emotional connections, driving loyalty and long-term profits. Consumers have access to nearly infinite data to inform their buying choices, and the competitive landscape has never been fiercer. Luckily, there's almost as much data available on your customers' browsing, buying and lifestyle patterns as they have on you -- and Gallup can help you make sense of it. Fully engaged customers represent a 23% premium in share of wallet, profitability, revenue and relationship growth over the average customer. Companies that successfully engage their B2B customers realize 63% lower customer attrition,55% higher share of wallet and50%higher productivity. Go beyond traditional, hit-or-miss satisfaction programs to truly understand your current and potential customers. Better understand your customers to create emotional connections and drive loyalty and long-term profits. We offer a comprehensive perspective on customer engagement. Fully engaged customers are 23% more likely than average customers to spend with you. Customer engagement forms the foundation of our customer analytics work because it is one of the best predictors of customer outcomes. Your company always delivers on what you promise. They are proud to be your customer. Your company is the perfect company for them. 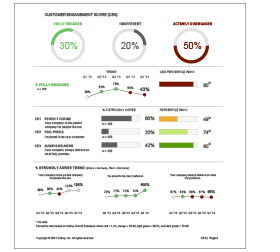 Gallup has helped the world's most customer-oriented B2B and B2C companies discover what drives engagement and has advised them on how to make changes accordingly. We'll partner with you to define and create the optimal customer experience. Based on more than 25 studies, Gallup's extensive report provides an in-depth look at what defines the millennial generation as people, employees and consumers. Through extensive research on today's marketplace, this report provides business leaders with an in-depth look at the attitudes, behaviors, wants and needs of changing consumers. This guide serves as a definitive road map to help B2B companies understand how to listen to -- and act on -- the voice of the customer. Subscribe for continuous access to nearly a century of proprietary data. Grow your customer relationships, grow your business. To learn more about our customer analytics services or to request a quote, fill out the form below, and a Gallup representative will contact you.